These are sermons from Bethany Lutheran Church and Rev. Mark Etter that you may use for personal growth or to share in your church or small group. Faith is often misunderstood in Christian circles and in the world. Luther said that we are saved by faith alone but what does that mean? Is faith just about going to heaven or to hell? Is there no real benefit to having faith in this life? This series looks to help you get a better handle on what it is like to live by faith. It is not as difficult as it seems unless we make it so. It is about dedication to God and others and reaping the benefits of having God and others on your side. It is about living different like an athlete does so that you develop new habits and train each day. In the end, like the athlete, you will have the reward and a better life in the process. When you understand what faith is all about, you will understand why it is a prize worth having. Start new habits - Acts 2:42-47 So you want to lose weight. There are libraries filled with books about health and exercise. Programs for weight loss and gyms filled with equipment fill our nation. None of that will make a bit of difference without new habits. Faith is the same. It is one thing to say you are a Christian. It is another to live out your faith so that it is your great joy and so that you are a benefit to others. Many Christians will get into heaven by the skin of their teeth, but they will not enjoy life here on earth because they have lousy faith habits. Devoting yourself implies that the habits were regular and consistent. It is the difference between having joy as a Christian and just getting by. It is the difference between being a blessing to others or someone that they tolerate. Here we look at four habits that each of us should make our own. Stop being consumers - Rom. 12:1-8 In our world, the customer is always right so demand your rights because they owe it to you. If you don’t see Pomegranates in the store, demand that they provide them. Ask your doctor to prescribe some drug you saw on TV to solve your stomach problems. Ever notice how it is all about me in this society. Look what it has gotten us as a nation. We are divided and self-centered and constantly beating up on each. There has to be a better way. In the book of Romans, Paul turns to the personal application after telling everyone about the cross. Dedication to God and to others is the basis for a community that works. You were saved for a purpose and this is how we are to live. Why do we make faith so hard? - Matt 11:25-30 In Jesus’ day, the Pharisees had placed so many rules and regulations on the people that religion had become like labor and a heavy burden. Rome had placed so many taxes on the people that it was hard to make enough money to feed your family. Our day has become more and complex. Healthcare has become complex as has saving for the future with the rules for 401K and Roth funds. Even phones and TV’s seem to baffle anyone over the age of 30. It tends to make us feel insignificant and cautious. Who do you trust in a world where they change the rules on you every day? Jesus is here to help. To a society who is confused and stressed out by all the competing claims, He has answers and He alone will give us rest. You can’t get away from the labors of life, but you can have Jesus’ help. It is all about three words: Come, take, and learn. Paul could never stay in one place when there were open doors for preaching the Gospel to new people. He begins the second missionary journey encouraging many of the churches that he saw on the first journey. They needed the message that God wanted the gentiles as much as the Jews. After the Holy Spirit prevented him from going north and west in Asia Minor, Paul was led to begin preaching in Europe. On the way, he found new partners in Silas, Timothy, and Luke. He also began churches in places that we know like Philippi, Thessalonica, and Corinth. The gospel was moving forward with God’s power. Unknown God - (Athens) Acts 17:16-34 Athens was a city past its prime. 400 years have passed since the golden age of Athens. It is no longer the political center of Greece, but it still is a city of beautiful art and is filled with philosophers. It is also filled with altars for over 30,000 gods including one called the unknown god. Every morning I hear the cry on the morning news looking for heroes. Yet, the heroes fall one by one. The movie star has an affair. The technology has bugs. The hero is all too mortal. Like Paul, we need to realize that these people don’t know Jesus and need answers to basic questions of life. God never wastes a hurt - Acts 16:16-40 It was a turning point in the church. Up till now, the Christian church was Middle Eastern and Asian. Philippi begins the move to Europe where the church will flourish. Yet, the beginning is not without challenges. Paul will even find himself beaten and imprisoned. The lesson of Philippi is simply that difficulties produce opportunities. In the church problems often mean that you are succeeding. Instead of moving back in fear or calling a problem failure, God wants us to trust that He has a solution. He wants you to move forward instead of being frozen by challenges. Following God’s Direction - Acts 16:1-10 Paul had preached across his home area of Galatia, sent them a follow-up letter that we know as Galatians, and attended a conference in Jerusalem defining the role of Jew and Gentile in the new church. What do you do next? What has God got in store for you and how do you know? We often want to do great things for the Lord. We want an evangelism event to have great results. We want the church to grow by leaps and bounds. Yet, it is often the ordinary things that we do and the heart that cares about sharing the message that brings explosive growth. God has a plan and people who do the ordinary things of the Christian faith will find the greatest blessings. Gentiles (not) welcome - Acts 15: 1-21 - What does it take to be a Christian? It is not an idle question. The early church was divided on the place of Gentiles in what had been a Jewish church. They wrestled with how much of the Old Testament law was necessary for the gentiles and if they could be full-fledged members of the church even with such piety. We still wrestle with the question of belief and salvation. Every denomination uses a different criterion from baptism by the Holy Spirit to devotion to the pope. The text for today is the church’s attempt to solve the question of what makes a Christian. The answers to all the burning questions of our age are found in the first chapters of Genesis. How and why was the world made? What is marriage supposed to be like? How did sin come into the world? Why do people have to die? What is God's solution to our sin? Those questions and a dozen or so more are answered in these first pages. These first chapters form the foundation of much of what the rest of the Bible will teach. Join me as we look at a few of the sections of Genesis 1-9 that will provide many of these answers. God doesn't want us to be ignorant of the truth, but to let His truth set us free to live with joy and love. Hope and renewal in tribulation -Genesis 8 She laid in a hospital bed with tubes strung from her body and a monitor beeping over her head, she felt forgotten. The heart attack had passed and she was still alive, but now what? What would the future look like and could she even go back home? Locked in an ark for over a year, Noah and his family must have had some of the same thoughts. They alone had survived the flood, but what would life look like in the aftermath? This chapter is about renewal and hope after the crisis. When the storms of life happen, take courage in what the Lord will do for you and be ready to celebrate His mercy. Ordinary work, an extraordinary God - Genesis 7 "Oh no, turn back, we forgot something!" You have made lists and tried to think of everything, but there is often one thing left unprepared. No one wants to go on a trip and figure out that you have forgotten something important. How do you prepare for a journey on a 450-foot ark? Once the rains come, there is no turning back. The one thing that I see Noah doing that I often do forget is to trust the Lord. Noah does the ordinary things and trusts God to do the extraordinary. As we look at Noah, we can learn a lot about obeying God and letting Him do what we cannot do. An opening for grace - Genesis 6 They cut off Bill’s leg to save his life. He had a cut on his foot and it became gangrene. It was either the foot had to go or the infection would spread through his whole body. In a way, the flood was such an operation. Mankind had become evil and God had to cleanse the earth with a worldwide flood. It was a tragic thing to do just as cutting off a limb is today. The flood was an act of salvation for the race of humans. It was God destroying evil so that good might survive. Sin spreads like weeds Genesis 4:1-16 How did one sin spread to take over the whole world? Eating the forbidden fruit doesn’t seem so bad to many people. Few people would say that killing your own brother isn’t a grievous sin. I think that the Bible records this sin to show us how far sin spread in the few decades since the first sin. Truth is that sin spreads like weeds. One sin often leads to another and Satan is always busy teaching us to sin in new ways. It was like the floodgates were opened up with the first sin in the garden. Anatomy of Temptation Genesis 3:1-24 “There is nothing certain in life but death and taxes.” The question is not if we will die, but why we all will die. Many people can’t reconcile a perfect loving God with sin and death. If God is so loving, why must people die and why did He make us this way? Genesis 3 provides the answer to the question. We accepted Satan’s lies and wanted to be our own God because Satan promised that we could become like God. Death began with a man and not with God. Plea for the nation - Psalm 80 Israel was in trouble. The people needed God to lead them as He had done for them through the desert. Our nation is more divided than it has been at any time since the civil war. Angry voices shout that their way be done! Hate has become the temper of the nation. We sing God bless our native land as we celebrate the fourth of July this week. We will pray for our nation. Pray that the Lord help us to be strong. The psalmist wants us to pray that God change the cause of the problem not just the symptoms. He will pray for four changes that will bring the peace and unity that we desire. Plea for protection - Psalm 57 David was looking up to heaven from a dark cave. He had killed Goliath and been promoted to general in the Israeli army. Now he was stuck in this desert cave hiding from Saul for dear life. He had said to Jonathan only months before this, “What have I done? What is my crime?” (1 Sam. 20:1). If anything distinguishes David’s prayers from my own when I desire God’s protection and deliverance, it is in the area of trust and purpose. I hope that God will save me. David believed that God would prevail. David knows things look bad, but that God will triumph. We, too, need to ask for help with such faith. Plea for forgiveness Psalm 51 Feeling sorry for your sins is just the beginning. Even if the sorrow is true and not halfhearted or just words said to make others feel good, there is more to forgiveness than a few words. David was hit by all that and more. He had given into the sin of lust and had committed adultery and murder. David knew how far he had fallen. This psalm is a classic plea for forgiveness. David not only asks for the sin to be forgiven, but asks that his life be changed. David wants God to clean up this mess in a way that no human being can ever do. Plea for Strength Psalm 39 We often get angry with God, with ourselves and with others when we get severely sick. We make demands of God and the people around us because this shouldn’t happen to us. Ever since the fall of Adam and Eve, all men and women get sick and everyone will someday die. We act as if our illness is not normal, but how long is life and what can we really expect in this life? David has a better prayer in this psalm and if we follow his prayer, we can have joy even in our suffering and learn from our pain. We will learn a right attitude toward the Lord that will be a help to us. Plea for vindication Psalm 26 It is easy to picture David living in a day when the whole kingdom is godly and every person is following the lead of their king in worshipping the Lord at the tabernacle. This Psalm shows the dark side of David’s kingdom. He describes deceitful men who are hypocrites. It is easy for us to wish for a perfect world. It will never happen. The lure of sin is too strong for many. David, however, asks for more than protection from God. He wants the Lord to help the faithful to not give into evil. As we pray for vindication, pray for God to keep you from becoming evil as well. Having been chosen by God and sent by the church at Antioch, Paul, Barnabas and John Mark go home. First, they visit Barnabas’s home country of Cyprus. 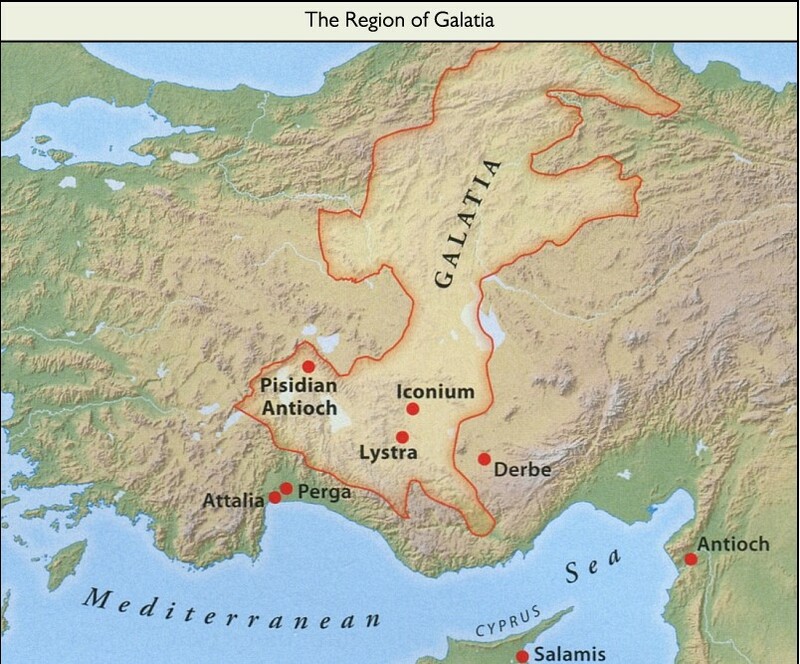 Then they head to Galatia in Asia Minor (Turkey) near Tarsus, Paul’s hometown. It was in their heart to reach the key areas so that they might reach as many people as they could with the gospel. As we start with Paul’s conversion and move through his first missionary journey, we have a sense of what God was making of this man who was once an enemy of the church and would become one God’s greatest servants. What does success look like? - Acts 14:1-7 Ministry often seems like a dance. Two steps forward and one back. We whirl round and round the room like a couple doing the waltz and end up back at the same place we started. Are we really getting anywhere and does it really matter? Why can’t we be more like St. Paul in the bible? Give us grand tours that will bring the message of salvation to kings and countries. Oddly, Paul’s ministry was more like that dance than the impressive ministry that we often imagine. He made progress but often had to keep pushing forward to make any progress at all. In Pisidian Antioch - Acts 13:13-45 What do you say when someone asks you to speak? “John, I know you go to church, I have struggled lately because my mother has been in the hospital. Tell me about Jesus.” If there were ever words that stop you dead in your tracks and cause your heart to skip a beat, those words rank right up there. Someone invites you to talk about your faith. What do you say? Saul and Barnabas are given such an opportunity. Paul spoke simply about what God had done and so must you. Like Paul, remember, it is all about Jesus. He alone can help the broken heart. The strategy of the Spirit - Acts 13:1-13 What is next? The church that once was centered in Jerusalem has fanned out into Syria and beyond. Persecution in Jerusalem and the faith of hearts on fire for God has spread the gospel to new lands. And so we find these five men praying about what is next. It is the question that many churches struggle with. Our world is changing just as theirs did. We see people struggling with busy lives and fractured families. Our answer begins with a people in prayer whose hearts are burning for the lost. Saul in Damascus - Acts 9:19-31 I have seen people talk about their family, their job, or some hobby every time you see them. They share whatever has the fire in their heart and makes them happy to be alive. I have even known a few who have that fire when they are talking about Jesus. Paul was like that from the very beginning. His faith is just days old and the fire is lit. He has to tell his story. He has to tell about the Jesus who he met on the road. Paul’s Conversion - Acts 9:1-19 What sets Christianity apart from other faiths is that it is about relationships and not religion. Religions are based on a set of rules and doctrines. Christianity is different. It is based on a relationship with a loving God. If there is a difference between Saul the persecutor of the church and Paul the great missionary, it is found in contrast between religion and relationship. Saul the Jew was all about keeping the religion pure. Paul is about a relationship with the risen Christ that changes everything. Most of the first converts and early leaders in the church were Jewish Christians who proclaimed Jesus as their Messiah. As Jewish Christians, they struggled with a dual identity: Their Jewishness constrained them to be strict followers of the law; their newfound faith in Christ invited them to celebrate a holy liberty. As the church branched out among the Gentiles, they wondered how Gentiles (non-Jews) could be part of the Kingdom of Heaven. This was especially a problem as Paul started reaching large numbers of gentiles on his first missionary journey. Judaizers—an extremist Jewish faction within the church—taught that Gentile Christians had to submit to Jewish laws and traditions in addition to believing in Christ. Galatians was written, therefore, to refute the Judaizers and to call believers back to the pure gospel. The Good News is for all people—Jews and Gentiles alike. Salvation is by God's grace through faith in Christ Jesus and nothing else. March 25 Is the Christian faith just a personal thing? Galatians 6:1-10 A lot of people don’t think that they need a weekly church or Bible class. It takes away from the one day that they have to sleep in. It means that they have to get up and put on at least clean clothes. Why bother. They’d rather read the bible by themselves at home. If they need church, they can watch it on television while they sit in their jammies and bunny slippers. The truth is that you will not survive well in this world if you don’t surround yourself with other Christians. Who is going to help you in those times of crisis? March 18 - Living by the spirit - Gal. 5:16-26 One of the complaints about the Christian life is that it is too hard. We find God’s expectations for us to be difficult or overwhelming. In the end, a lot of people quit. If we don’t leave, we feel guilty for failing God. What is impossible for one can be done with a friend. We need someone who will exercise with us or help us stop smoking and keep us accountable. Jesus promises such a friend in the Holy Spirit. He has the power to help us do the impossible. March 11 - Is Christianity just a bunch of rules? - Gal. 4:21-31 One of the criticisms of the church is that we are just a bunch of outdated rules. The church should get with the picture and update our theology. Yet is that really what the Christian church is? If we have given that impression to the world, then we have failed them. The Christian church is about faith and grace and not rules and piety. It is about freedom in Christ not slavery to Moses. This text is Paul’s concern that the Galatians were being pulled back to emphasize the rules and lose grace. Mar. 4 - Does God keep His promises? - Gal. 3:15-25 Many have walked away from the church because they don’t think that they can ever keep up to God’s standards. They live less than perfect lives and abandon God because they think he can’t love them. Are God’s promises conditional? Do we have to keep the law to get the grace? Does that mean that God sometimes changes His promises or can we really depend on what he says? Feb. 25 - Who is welcome in your church? Galatians 2:11-21 We still struggle with the question of who is welcome. We feel uncomfortable with people who are dirty or who have broken lives. We are glad to help the homeless at a shelter but are not sure what to do when they appear on Sunday morning. We welcome the divorcee or the couple living together but we struggle with their sin. Paul did battle with Peter over the issue of welcoming gentiles into the early church. Who is welcome in our church is still a question we deal with today. Feb. 18 – Is the Gospel enough? Galatians 1:1-10 The first missionary journey had been a successful trip. Hundreds had come to faith and Paul had planted churches on Cyprus and across Galatia. Then Paul found out that a group of Jews had gone behind Paul and Barnabas and sowed the seed of doubt in the minds of the people. Is the cross enough? Don’t you have to do penance or give up dancing or alcohol? It seems too simple for Jesus to die on a cross and you are saved if you believe. Matthew 5-7 is called the Sermon on the Mount because Jesus gave it on a hillside near Capernaum. This "sermon" probably covered several days of preaching. In it, Jesus calls His disciples to be different than the Pharisees and Sadducees of His day. He wants them to have sincere faith and not faith that is only outward appearance. In these six sermons, we are going to look at key sections of the sermon that reveal God’s expectation of what it means to be a disciple so that we can apply them to our lives just as the disciples did. Feb. 11 Known for Their Fruit Matt 7:15-23 Fake news has become a term used first by the president and now people on both sides of the aisle. Everything is shaded with bias and you often don’t know if the person really knows what they are talking about. Who do you listen to? Jesus has a few words on how to know what is good and bad information so that evil doesn’t lead you astray. Feb. 4 God's Generosity Matthew 7:7-14 - Life is filled with troubles that bring us down and make us lose heart. Where do we turn? Often we dismiss God because he should have kept those bad things from happening. Millions think that God doesn’t care because life is not perfect. To them and to us, Jesus says trust God to keep on giving. Jesus wants us to see that we have a generous God who keeps on giving and so we should keep on asking. Jan. 28 Faith must replace worry Matt. 6:25-32 - I find it hard to let go. You may have that problem as well. I struggle when the mechanic tells me I need a new thingamajig for my car with a $2000 price tag. We often struggle letting God take control of our life as well. The result is worry. if you want a life that is not riddled with worry, you have to let go and put God in control. Worry happens when we think we are in control and we realize that we can’t control anything at all. Jan 21 Real worship Matt 6:1-15 - Worship is something we all do, but I think that few Christians understand. Jesus will look at three parts to worship and show their deeper meaning and how to get the most out of worship. It begins with the right attitude and has the right focus. It builds relationships and a network of support that starts in heaven and leads down to earth. Jan 14 - Salt and light Matt 5:13-16 - Christian is a verb as well as a noun. It is who you are, but it is also what you do. You are to be people who change your world and lead people from darkness. You are not to be like the Pharisees of Jesus’ day who thought that they deserved special honor just because of who they were while they seldom lifted a finger to help people. Jan. 7 - The Beatitudes Matt 5:1-12 - The disciples were on cloud nine. The twelve were the right-hand men of Jesus the miracle worker and preacher. Surely they were on the way to fame and prosperity themselves. Yet, Jesus called them aside with the crowds looking on. It was time for a lesson. His kingdom was different. The Pharisees looked for pleasure and prosperity, but they would be servants.